Can art express questions about justice? Could art, perhaps, even create justice? In Aesthetic Justice, sociologist Pascal Gielen and curator Niels Van Tomme invite a variety of artists and critical thinkers—including Zoe Beloff, Arne De Boever, Mark Fisher, Matt Fraser, Tessa Overbeek, Kerry James Marshall, Viktor Misiano, Carlos Motta, Nat Muller, Julie Atlas Muz, Gerald Raunig, Dieter Roelstraete, Hito Steyerl, Julia Svetlichnaja, Hakan Topal, Samuel Vriezen and Christian Wolff—to reflect on new futures for the notion and practice of justice. 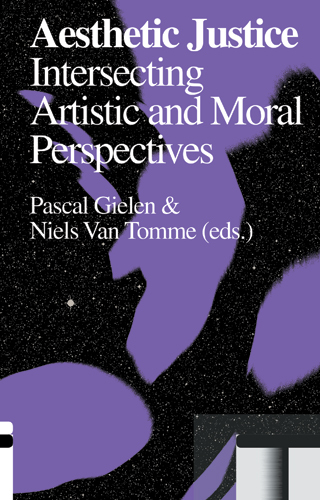 The book offers thought-provoking views on the ways in which art may confront and potentially redirect social and political futures. Incorporating analyses of contemporary artworks that challenge the social, political or economic status quo, as well as interviews with artists and theoretical reflections, Aesthetic Justice considers the liberating potential of aesthetic frameworks and suggests alternatives for a more just future.